Doors of the Championships will be open at 9am for officials, spectators, and competitors. This is a great opportunity for Beccles GTUK students to enter their 1st International Taekwon-do Tournament! Put in your diary & speak to your instructors about entering. apologies required in advance if you cannot make it. 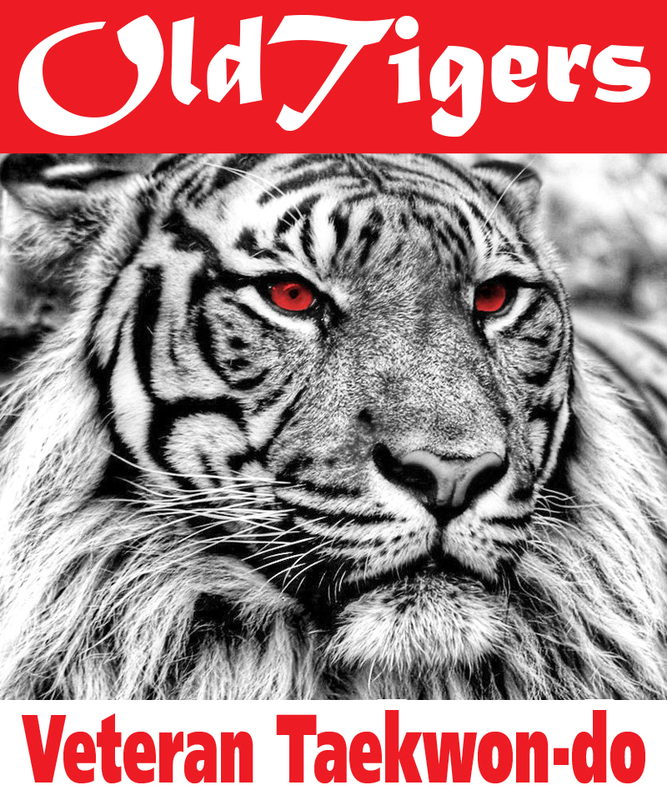 ‘Old Tigers’ Veteran Taekwondo Classes! 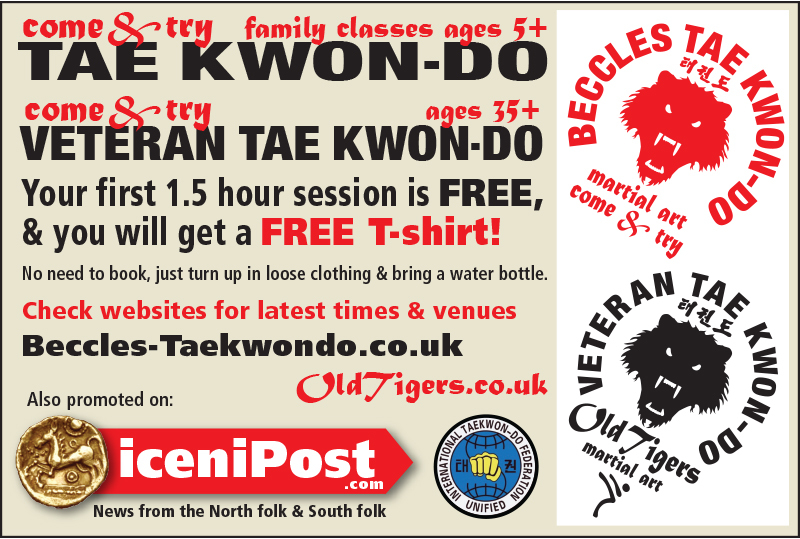 Old Tigers Veteran Taekwondo T-shirts to give away too! Yes we are running some Veteran Taekwondo classes for folks that live around the Beccles / Lowestoft area, a martial art for 40 and overs. Taekwondo can be practiced by anyone…there is no upper age limit! 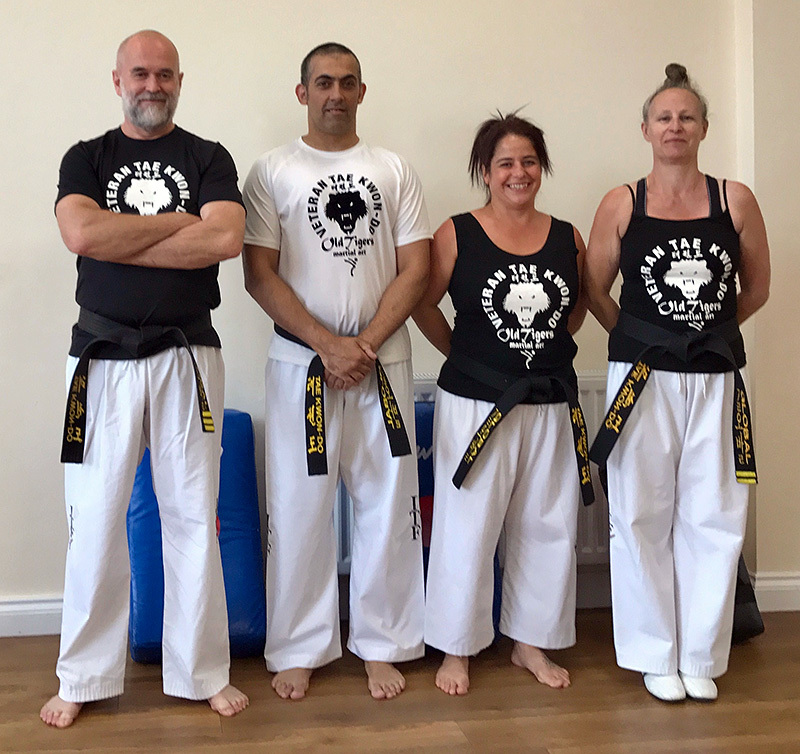 The chance to work with a group of Veteran Martial artists who will help teach you the way of Taekwon-do. Our training syllabus develops your ability to defend yourself using blocks, punches and kicks. Progress through our belt gradings will build agility, strength, fitness and self confidence, no matter how old you are. For those who are very competitive, we can train you to compete at national level against other veterans. Come and meet with us, we want you to experience the feeling of being part of one of the Worlds best martial arts, where you will make lifetime friendships, not just locally but globally!! Your journey starts here > Old Tigers Veteran Taekwon-do! What’s to lose? Free Session – Free T-shirt! and we will surprise you on what you can achieve! Anyone interested in this please come along, loose clothing and bring a water bottle as you may get hot! 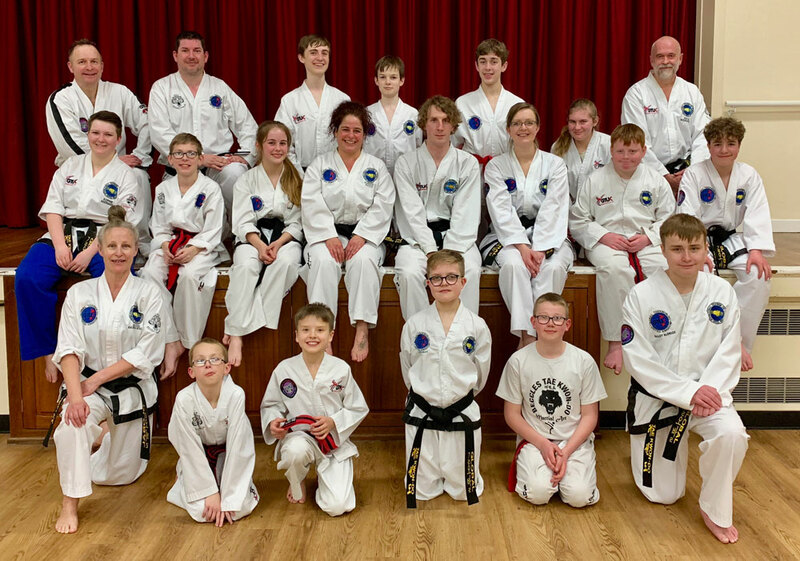 Both clubs have a very active student membership with over a 100 members between them and more than a third of them successfully completed their 1st Taekwondo belt grading of 2019. The grading was taken by GTUK Examiner Mr Steve King 6th Dan, who said that the quality of student sparring, patterns, techniques and Korean terminology was excellent across the board. There were some outstanding performances praised by Mr King from the Beccles students, newly promoted green belts Paulina Borkowska and Joel Thrower, along with Tyler Mingaye who had an excellent 1st grading. A special well done to Beccles’s Blake Goffin for passing his Provisional Black Belt grading and being awarded his Black Tag belt, Blake will now start preparing for his full Black Belt grading to be performed in front of GTUK Grandmaster Oldham IX degree at a later date. The spring is a great time to start this family orientated sport, giving new members time to learn their 1st belt syllabus in readiness for the June grading, it takes 3-4 years to learn the full syllabus and become a 1st Degree Black Belt student. If you would like to come and have a go the first session is always free. 1st Session Free, plus Free T-shirt! Ages: Peewees 5-11, Juniors 12-16, Adults 17-39, Veterans 40+. The Venue, Ringsfield Road, Beccles. Bungay High School gym, 9.45am for 10am start. Please make sure you bring your grading money (£28) into the club the week before. Remember to PRINT OUT and practice your Terminology for your belt grade! YOU NEED TO LET YOUR INSTRUCTORS KNOW IF YOU CANNOT MAKE THIS DATE. but if not please come and help out with the other colour belts. Well done Barbara for representing us at the GTUK Northants Interclub at the weekend. Pictured with Bungay’s Jade and Jaden who joined us on our Monday session, and congratulations to you all on your medal successes. You will burn between 900 and 1400 CALORIES in a session! 1st Session FREE! plus a Free T-Shirt! Join us for Fun, Fitness and Fighting! Getting fit and learning a self defence art, character building and great for self discipline too! Taekwondo transfers your energy around your body like no other martial art, creating explosive techniques, giving you the power to punch and kick through a minimum of 2inches of pine boards. Beccles Taekwondo New Members Welcome! Want to learn a proven martial art for self defence? Come and start a Taekwondo journey with us, beginning as a white belt novice through to a black belt expert. We welcome you to come and try for free! Those that do will be rewarded with a free Beccles Taekwondo T-shirt. It takes 3 to 4 years training to get ready for a black belt grading! We teach mixed age classes with students from the age of 5 upwards, all abilities, working at your own level. Experienced instructors and assistants work with you throughout your journey. So now is a great time to start a family activity and join our Taekwon-do lessons.